Last April, I bought some carrots. Moving to California (a land of cheap, fresh food sold in massive quantities) had made Bonnie Lee and I keenly aware of how easy it would be to waste food here — something we were determined to avoid — and a quick search on the Internet told me that carrot greens are one of the many foods most people feed to the bin rather than to themselves. It’s a shame. Although they lack many of their bright orange roots’ charms, carrot greens have a distinctive bitterness that can add an unexpected accent to a meal, and which balances nicely with other strong flavours. The first bunch of carrot greens I rescued ended up in some chicken soup stock — and that’s the way I use them most often. They add a layer of complexity to stock, and a healthy greenish tinge, though you still end up with solid waste when you use them that way. My latest experiment with carrot greens was the Purée of the Whole Danged Carrot Soup (recipe below) that I made for lunch yesterday. I balanced the bitterness of the carrot greens with a good dose of white pepper, and some cider vinegar and honey. I decided not to blend the soup completely, so that little specks of green and orange would still be visible. That gave the soup a bit of crunch and freshness that I liked, but I can see some folks being put off by the texture. For a smoother version, I would suggest throwing a couple of ounces of cooked potato into the mix, and blending the soup more throughly. Sauté the garlic, onions and carrots in the olive oil over medium heat, until the onions are translucent. Add in the chicken stock and carrot greens, and heat until carrots are tender. 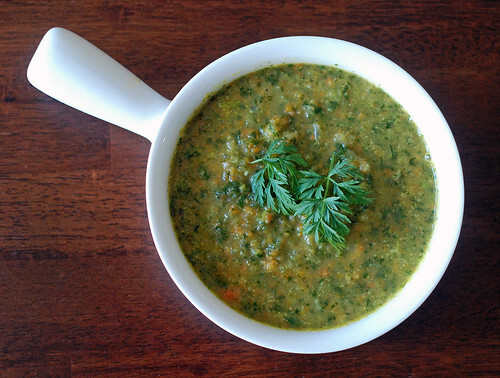 Remove soup from heat, and purée using hand mixer or blender. Add in the honey, vinegar, salt and pepper; stir well, and warm soup back up to serving temperature. Plate and garnish with carrot greens. This entry was posted in Waste less recipes and tagged carrot greens, carrots, food, green, soup, sustainability, sustainable living, Waste less recipes by Jean-François. Bookmark the permalink. Thanks for the tip. I would never have thought about this. And congratulations for having become such a good ‘chef’: I’m impressed! Glad you liked it — and you win the prize as the most loyal reader so far. :) If you’re ever in L.A., will happily play chef for you and your mate. We had the same thought last summer – and so made a carrot greens “kinpira” – which turned out delicious! Though it isn’t often that carrots are sold with the greens here in the stores in Japan. We found these at a farmers market. And yes, I miss the thin sweet varieties we had in California! Your soup looks tasty – I must try it. And I will opt for your “chunky” version, as I quite enjoy that texture – and it makes a great visual as well! Thanks — carrot green kinpira is a good idea. I was thinking tempura might be interesting too, with a little wasabi salt. Will let you know how that experiment goes. Nice recipe…I’ve saved it. We are all about sustainable living and eating ALL of the edible parts of a vegetable. I do love our worms, but they get plenty of natural organic matter already. My first order of work is to feed my big family and keep them healthy! Greens have so many wonderful benefits. Keep up your blog. It’s a very worthwhile project you have undertaken. I look forward to your next posting. Thanks, Shannon — I’m glad you’re enjoying it and find it worthwhile. Hopefully it will help make a few people’s trash cans emptier and leading them to a few interesting food discoveries. Let me know how the soup works out. I will! I promise to even let you know how well the kids liked it, because that’s the most important critique on a recipe I try. Also, here’s a great list from our own Texas Aggies on the parts of veggies that are edible. Great list! Thanks for sharing it. I do pretty much the same thing with Queen Anne’s Lace. (Daucus carota). It is the wild ancestor of the modern orange carrot. The tops can be, and are used, in exactly the same way. (Though the root of the older Daucus carota is woody and more suitable for boiling in a soup than eating out of hand.) Any time I make greens over rice, or make a soup, I throw in these carrot greens and chop them up fine. They add a wonderful layer of flavor.